Graphene was central, as molybdenum disulphide was anchored to reduced graphene oxide. This allowed for both materials' properties to be applied and the ink not only increased the stability but also the performance of the PSC. "Thanks to this research, we have overcome a major hurdle to adopting this new technology," said Emanuel Kymakis, work package deputy leader for energy generation. "With the new levels of stability and performance, we could see the mass adoption of PSCs in the next few years." Once the PSCs stability is solved, attention can focus on scaling up production. Manufacturing PSCs requires solution processing, that can be ramped up to an industrial scale. Due to the flexibility, PSCs can be applied to nearly any surface and produce electricity. Andrea C. Ferrari, Science and Technology Officer of the Graphene Flagship and Chair of its Management Panel added: "the potential of graphene and related materials to improve solar cells has been recognized since the beginning of the Flagship. 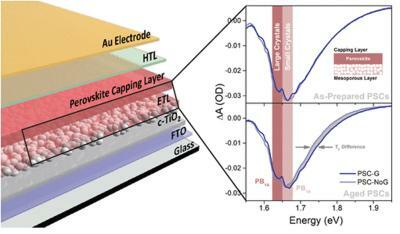 Their combination with the emerging field of perovskite solar cells now allows a crucial step forward in stability. This validates the major investments in spearhead projects on solar cells done by the Flagship and paves the way for the novel solar farm we will develop by 2020." MIT's graphene and molybdenum-disulfide based solar cells to achieve "ultimate power conversion"